Some passages have insight into the modern world where applicable. Hagakure Kikigaki, also known as Hagakure, is a book of Samurai wisdom written more than 300 years ago by Yamamoto Tsunetomo, a clerk who served during the age of the Samurai underneath Nabeshima Mitsushige–A Japanese Daimyo. Daimyo is a term for a Feudal leader; someone who possessed land; similar to a King in Feudal society during the middle ages. Hagakure is broken up into 11 books. But you can’t tell. All of Hagakure is roughly 200 pages depending on the translation. 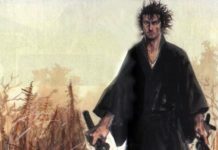 The different books feel like different conversations between the Samurai. You’ll see, many pieces of wisdom are repeated, or contradicted. Yamamoto Tsunetomo was a Samurai: a servant to a lord. Not all Samurai fought in battle. Yamamoto didn’t. 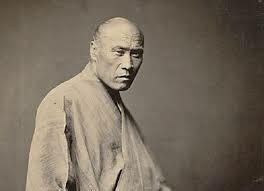 Instead, he served his lord, Nabeshima Mitsushige, and did whatever his Daimyo required of him. Hagakure is a series of insights; wisdom passed down from Lord Nabeshima Mitsushige to Yamamoto Tsunetomo. Even though Yamamoto Tsunetomo is the author of Hagakure, he didn’t compile the wisdom into a book. Yamamoto Tsunetomo engaged in conversation with a man who very little is known about: Tashiro Tsuramoto. 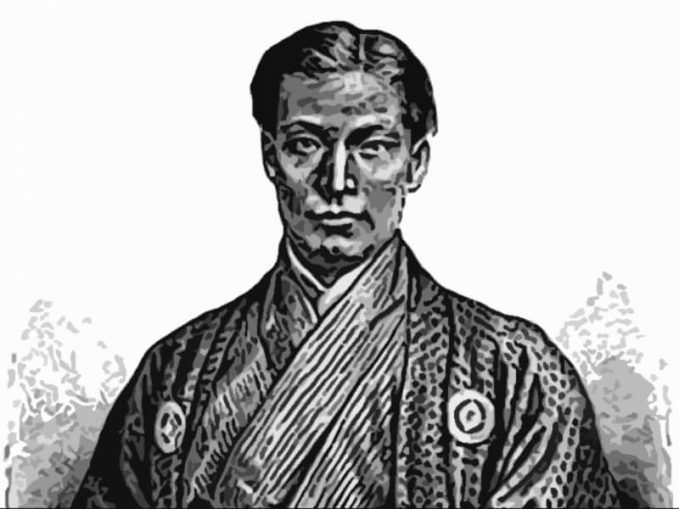 This man compiled the conversations with Yamamoto into the book Hagakure we now have today. Actually, we can credit most of the book to Tashiro for compiling Hagakure. Hagakure translates to Hidden Leaves, or hidden by the leaves. This naming convention is in reference to the hidden wisdom of the Samurai that few understand or acknowledge. Hagakure was written during a time of peace. Samurai, meaning warrior, were the warrior-class of the era during Tsunetomo’s life. During this time the Samurai didn’t have much purpose–dueling was banned–as was Seppuku–ritual suicide. It was common for a Samurai to follow their master in death by committing ritual suicide. Seppuku, ritual suicide, occurred by slashing open the stomach; believed to allow the soul to travel to heaven so the Samurai could continue serving the master. Nabeshima Mitsushige, Yamamoto Tsunetomo’s master–hated ritual suicide, outlawing the practice in his domain. Because of this ban, Yamamoto Tsunetomo, at the event of his master’s death, committed to being a hermit for the rest of his life. At this period Tsunetomo penned Hagakure: his attempt to spread Samurai wisdom and the true Samurai way to younger Samurai. He believed many Samurai were lost; living without honor because of the lack of discipline in the current era and the banning of duals and ritual suicides. Samurai believe death was the answer in all circumstances. You’ll see throughout the book, recommendations of death instead of living. A good death was the aspiration of all great Samurai. Hagakure was written during a strange time for the Samurai. Dueling was outlawed. No wars were fought. And ritual suicide was outlawed. The Samurai based much of their lives on the premise of sacrificing their lives for their master at a moment’s notice. 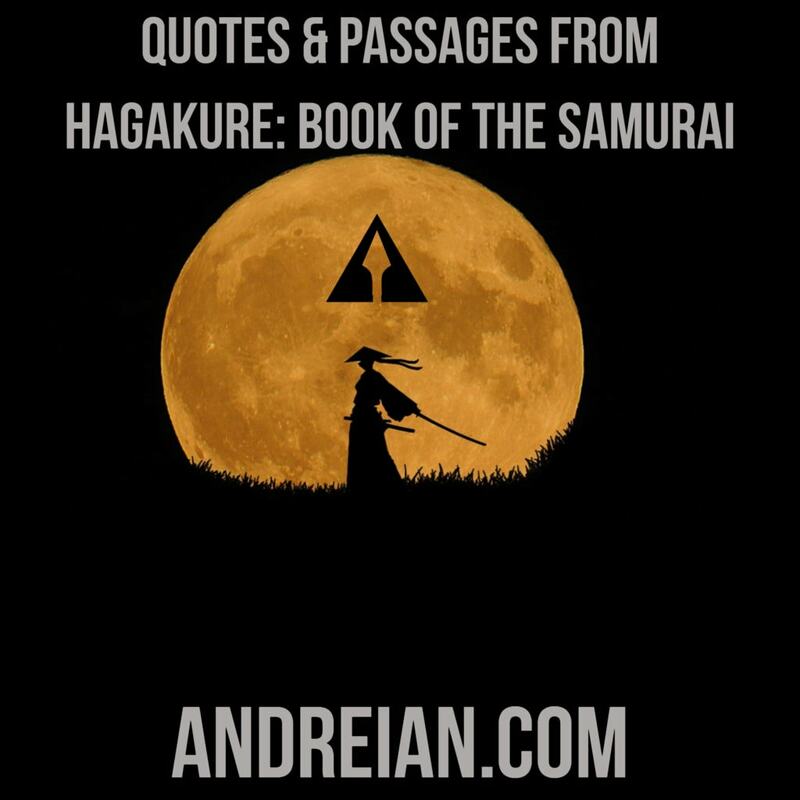 Hagakure is a book of wisdom for the Samurai. It is a book of honor. Much of the advice listed within will not apply to modern life. But, many quotes and passages from Hagakure do translate to living a good life today. 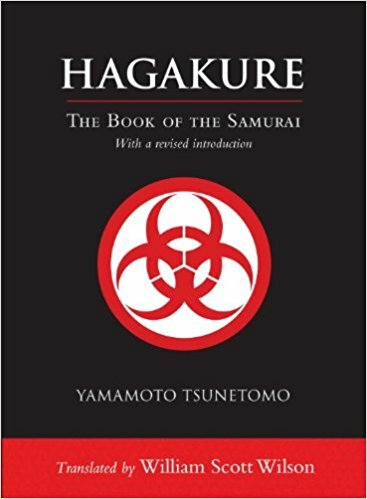 Hagakure is a wonderful book and a fascinating look into the minds of some of the greatest warriors to have ever lived. It’s cheap to buy, and, if you look for a few minutes online, you can likely find a free but outdated copy of Hagakure. The copy listed above is a dependable translation. We’ve read Hagakure, front to back and compiled quotes and passages valuable to the warrior on the path to a greater life today. The quotes are roughly in order of the book. Enjoy. As is usually the case with a man’s training, one will not succeed without being haughtily believing in your true worth as a man of service. Relying only on cleverness and talents [devoid of single-minded devotion] is a lower form of service. This world is full of cowardly, spineless men who think only of self-gratification and satisfying their own greedy desires. Presenting one’s opinions to others to help them rectify their faults is an important act of great compassion, and is the duty of a retainer. In offering one’s opinion, one must first ascertain whether or not the recipient is in the right frame of mind to receive counsel. If a bad habit has become ingrained over many years, it cannot be remedied easily. It is good practice to think things through when going to visit somebody. It is generally best to avoid visiting somebody unexpectedly when you have no business there. The prepared warrior is not only able to solve problems in a quick and commendable fashion by virtue of his life experience, but he can react appropriately through his comprehension of measures to meet any scenario. He is always ready. The pulse of a man is different to that of a woman. There are few who can be thought of as a real man. This means that one man can surpass others by making just a small effort. The point is to have correct thoughts without letting evil thoughts manifest. Generally, a man who is not of a suitable high standing to speak his mind to his lord, but does so anyway, is disloyal. Knowing the Way is to know your own faults. Some people like to talk big, but act in a way that doesn’t match their words. The middle path is generally the best way, but with regards to samurai engaged in martial affairs, this will not do. The samurai must strive to outdo others. 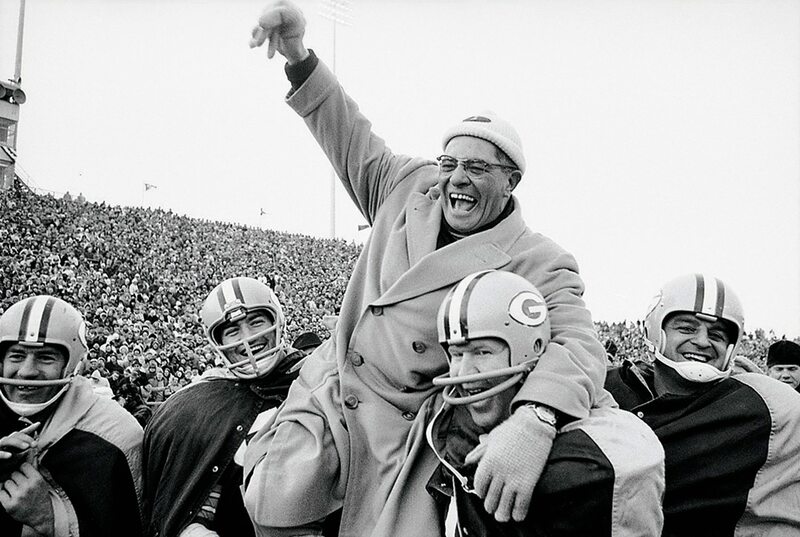 Winning from the outset is the only way to attain victory in the end. Cowardly behavior learnt during boyhood will remain ingrained as a lifelong flaw. Be clear in stating your opinion if you disagree with what is being said. be mindful of where you are and who is around you when you are chatting. You are a coward if you harbor a fear of failure when conducting your duties. Never spurn a person who has shown you favor in the past. A samurai’s word is harder than metal. Once I have decided something, not even the gods can change it. A calculating man is a coward. This is because he considers everything from the perspective of loss and gain, and his mind never deviates from this track. One cannot accomplish great exploits in a normal frame of mind. When challenged by adversity, charge onwards with courage and jubilation. There is no need to reveal all that is on your mind. Your qualities will be apparent through your daily actions. Nothing is impossible. With single-minded resolve (ichinen), heaven and earth can be moved as one pleases. There is nothing that cannot be achieved. Be conversant with wise men, and seek lessons in morality from them. A samurai who does not care much for his reputation tends to be contrary, is conceited, and good-for-nothing. He is inferior to a samurai who craves glory, and is thus completely unusable. It is a timorous coward who winces at an important task and withdraws because of the danger. If you meet with failure in your mission despite your best efforts, it will be lauded as an honorable death. Those who revel when times are good will wither in adversity. You need nothing more than to maintain a pure mind, and stay vigilant as you execute your duties. Just live for each moment with single-minded purpose. Success gained too early in life will not endure. The extent of one’s courage or cowardice cannot be measured in ordinary times. All is revealed when something happens. A man’s life is very short, so it is best to do what he enjoys most. When someone blathers incessantly, it is probably an indication that something else is on his mind. The thrust of one’s spear will be ineffective if lacking in fighting spirit. One cannot advance without great courage. The more hardship, the better. There is nothing worse than having regrets. All samurai should take care not to do anything they will repent later. Anything is achievable through single-minded endeavor (bannō-isshin). Insight: You cannot be a tough-guy all the time. You’ll be unbearable and look weak–like you’re covering a deep insecurity from childhood. On the reversal, never standing up for yourself will make you a target. The prime target. A victim to all. 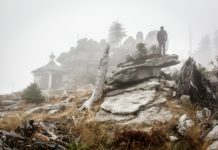 Although presumptuous of me as a hermit, one who has taken the holy orders, not once have I desired to attain Buddhahood in death; instead, I only want to be reincarnated seven times as a Nabeshima clansman, with the determination resolutely etched in my gut to uphold the tranquillity of the Saga domain. The following is my own professed oath: I will never fall behind others in pursuing the Way of the warrior. I will always be ready to serve my lord. I will honor my parents. I will serve compassionately for the benefit of others. By chanting these four oaths (shiseigan) every morning and night to the deities and to Buddha, you will become imbued with double your strength, and will never lag behind. 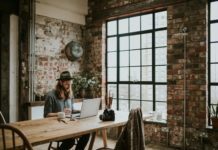 Insight: When you’re taking a break someone else is working. Your limits exist to be pushed. This is the way. When you’re about to quit, go a little farther. Push the boundary out. Next time, the line remains to where it was last pushed. You can build an endurance to hard work and sustain much greater loads. Yawning in the presence of others is impolite. If the urge to yawn suddenly arises, rub your forehead in an upward stroke to suppress it. If this is not enough to restrain the yawn, use the tip of your tongue to lock your lips shut, and cover your gaping mouth with your hand or sleeve to conceal it from others. Sneezes should also be stifled. Sneezes and yawns make you look very silly. There are many other points of etiquette that you should be mindful of at all times. Insight: Yawning makes you silly. But no one really cares. The advice above works if you feel the urge to control a yawn. The technique may come in handy if your boss is presenting so you don’t seem disinterested. Master Jōchō pondered tasks for the coming day and wrote them down. Being organized keeps you a step ahead of others. When scheduled to meet somebody the following day, make a careful assessment the night before, contemplating appropriate greetings, topics of conversation, and points of etiquette. Insight: The path. Your destiny. All you need to do is find what brings you joy and do that skill until you die. What you select must be a skill which can be measured–improvement, measured. There is a lesson to be learned from a downpour of rain. If you get caught in a sudden cloudburst, you will still get a drenching even though you try to keep dry by hurrying along and taking cover under overhangs of roofs. If you are prepared to get wet from the start, the result is still the same but it is no hardship. This attitude can be applied to all things. Insight: Don’t be attached to an outcome. Expect nothing and you’ll never be unsatisfied. Quell your desires and tranquility becomes yours. It is said: “When you make a mistake, never hesitate to correct it.” A wrongdoing can be rectified immediately if you are quick to address the problem. It will look worse if you try to cover it up, and you will suffer more. Insight: Problems compound when problems are hidden. Self Authoring is a good way to uncover your hidden problems. An ancient saying goes: “Think, and decide in seven breaths.” Lord Takanobu commented: “One’s judgement will diminish with prolonged deliberation.” Lord Naoshige said: “Matters decided at a leisurely pace will turn out badly seven times out of ten. There is no point in one’s training in which one reaches the end. The instant you think you have finished, you have already strayed from the path. Realize that nothing you do is perfect until you have taken your last breath; then, when you are dead, you will be seen as having completed the Way. Insight: Self fulfillment through accomplishment. The way. An extension of passage six above. Find what you love and let it kill you, as Bukowski would say. I kept a diary when I was young, and called it “A Record of Regrets.” In it, I logged the mistakes that I made each day. Not a day passed when I didn’t commit 20 or 30 gaffes. There was no end to what I had to document because of my incessant blundering, so I eventually stopped. Now, when I reflect on each day before retiring, there is not one that is free of slip-ups in word and action. Indeed, it seems that a perfect day is impossible to pull off. Men who wriggle their way through life relying on their talents will fail to grasp this. Insight: There is no such thing as a perfect day. There is only your ongoing pursuit of perfection that the Samurai chased every day. All that matters is having single-minded purpose (ichinen), in the here and now. Life is an ongoing succession of ‘one will’ at a time, each and every moment. A man who realizes this truth need not hurry to do, or seek, anything else anymore. Just live in the present with single-minded purpose. People forget this important truth, and keep seeking other things to accomplish. I would proffer to physicians that if people who are sickly suppress their sexual desires for six months, or a year or two, they will recuperate without need of any special treatment. Most young men are weak-willed. It is woeful that they lack willpower to control their carnal urges [for the sake of their wellbeing]. As the saying goes: “The more water there is, the higher the boat rises.” A competent man, or one engrossed in a pursuit he enjoys, will relish the challenge of surmounting difficulties. There is a huge difference between these men, and those who feel as though they are drowning when the going gets tough. Insight: Challenge is a blessing, not a curse. You are a boat. Whatever you faced in your past: You’ve overcome. But we forget how strong we are. You can do anything.